Heat oven to 350°F (325°F for dark or nonstick pans). Grease bottom and sides of 13x9-inch pan with shortening or spray with cooking spray. In 4-quart saucepan, melt 1 cup butter over medium heat; remove from heat. Mix in granulated and brown sugar, vanilla and eggs until well blended. Stir in flour, 3/4 cup cocoa and salt until well blended. Stir in 1 cup each semisweet and white chocolate chunks. Spread in pan. Bake 30 to 35 minutes or until set. Cool completely, about 1 hour. In large bowl, beat powdered sugar, 1/4 cup cocoa, 1/4 cup butter and enough of the milk with electric mixer on low speed until frosting is smooth and spreadable. Spread over brownies. In microwavable container, microwave 1/2 cup white chocolate chunks and the oil uncovered on High 30 to 60 seconds, stirring once or twice, until thin enough to drizzle. Place in small plastic food-storage bag; cut small hole in corner of bag. Drizzle over frosting. For brownies, cut into 6 rows by 4 rows. For the best results, use chocolate chunks, not chocolate chips. 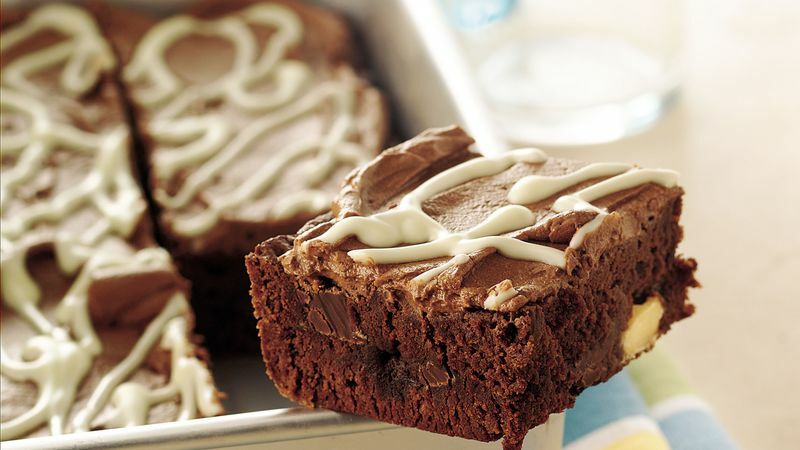 The chunks contribute to the fudgy texture and richness of the brownies.